This gallery includes: worms, anemonies, and other miscellaneous subjects that I have photographed on black water dives. Scroll down to see them all; click on any image to see it full-size and start the slide show. 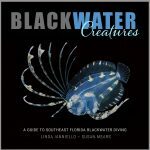 A black water dive consists of going approximately three miles off the coast of Southeast Florida and performing a drift dive in the gulf stream, at night. It is approximately 500 – 700 feet deep, but we generally stay in the top 40 feet. It is fascinating to find and photograph the pelagic animals who spend their whole lives in this environment, the various larvae that spend the early part of their lives here, and the deep water animals that migrate vertically at night to feed. Please use the Contact Me page to let me know if you see anything that is incorrectly identified, or if you can provide a missing ID, or for any other helpful information. I really do appreciate the feedback.